Our office is conveniently located off both Highways 15 and 215. Tractor-trailer parking available directly across the street as well as next building over. Walk-in and appointments available Monday – Thursday. Dr. Albrecht and his staff R.N. will see you in the office or come to you directly with the Xpress DOT Mobile Exam Office. Dr. Albrecht has been in practice for over 24 years, with over 8,000 patient examinations completed. 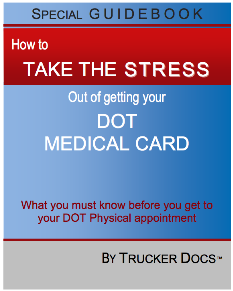 He understands the needs, stresses and time limitations of commercial drivers. He and his staff will succeed in getting you back on the road in the most cost effective and efficient manner possible. Located near Rancho Springs Hospital, SAMS Club, The Home Depot and Lowe’s. Serving California local areas: Temecula, Murrieta, Lake Elsinore, Wildomar, Menifee. This is a late review … sorry Dr. Albrecht. Dr. Albrecht had me certified in less than an hour! I called that morning and they were able to get me right in. I highly recommend Dr Albrecht. Very Professional no waiting , Friendly staff . I was able to get in with Dr. Albrecht immediately. The office is clean, friendly and inviting. short wait for my appointment and the DOT Physical was done quickly. I observed the rapport Dr. Albrecht has with his patients and I could tell he is a friendly caring doctor. Such an amazing experience I will be coming back! Thank you so much. walking in the door. This is such a friendly office. The exam was quick and I passed with no problems what so ever. I liked Dr Albrecht and his staff. my experience was amazing. I will be back again and also make appointment for my wife. Dr. Albrecht, and his Staff were great. They were able to get me in quickly for my DOT Physical, and out and on my way. Dr Albrecht was very professional and knowledgeable. I am returning to work after an injury and he was patient and thorough in reviewing my medical records. Thank you for the great experience. Very professional office staff. I recommend this facility to anyone who needs their DOT exam completed at short notice. Excellent pricing. Outstanding experience. Nice comfortable office. Very friendly, yet professional staff. This was my first time renewing my commercial license medical certs with Dr Albrecht. I will do it again with his office in two years. Very knowledgeable with what was required on the exam so he didn’t waste time reading the paperwork and trying to figure out what he was supposed to be doing. I was impressed enough to ask for some business cards to share with my coworkers who will need similar exams. Called and got a same day appointment. Staff and Doctor were friendly no waiting. I would recommend and use them again. Very friendly fast service would recommend to anyone! Best place around to complete your DOT Medical Exam! Same day appointment, no waiting once I got there. Dr. Albrecht is friendly, knowledgeable, and efficient. They have all the DMV paperwork there are ready to go to save you time. I will definitely be back in two years for my next DOT physical! AMAZING! Called for an appointment and within a 1/2 hour of my call I was being seen by Dr. Albrecht — talk about NO WAITING (my PCP’s first available appointment for a DOT exam was over a month out)!! And, price-wise, he can’t be beat (my PCP’s cost = $120.00, Dr. Albrecht = $85.00)! And, if those two points aren’t reason enough to go to Dr. Albrecht for your DOT exam, here are a few more: clean facility, kind staff and a Dr. who knows his s**t about the DOT requirements! As a native Bostonian, I’ll simply say: the whole experience was WICKED AWESOME! Fast, friendly, professional service. Wouldl recommend to anyone. I highly recommend Dr. Albrecht for a DOT exam. The whole experience was positive. The office is new and extremely clean. Hygiene and tidyness are a priority there. Everyone working there acted highly professional. I felt very confident in Dr. Albrecht’s abilities. He is very knowledgeable about all the DOT requirements. He told me the result of each step of the exam as we went through it. Another positive point is that Dr. Albrecht does not charge an arm and a leg for the exam. Most other clinics in the area charge $130 – $150. Dr. Albrecht only charged me $84. I think he gave me a $15 discount, which I appreciate. Highly recommend this place, was quick and easy! Got a dmv physical from Dr Albrecht,the whole process was fast & easy.The doctor & his staff are super friendly & I would recommend any cdl driver to visit Dr Albrecht for their dmv/dot physical. I can highly recommend having your DOT Exam here. Dr Albrecht is very knowledgeable with the requirements of the Exam. Having used Clinics for years, I now think it’s better to have a Doctor well versed in the DOT requirements conduct the exam rather than a Nurse Practitioner at a Medical Clinic. I made a next day appointment, but they also does walk-in’s. Dr Albrecht made it a very pleasant experience, explaining everything as we moved along. My name is Fred J (admin edited for patient privacy). I would like to stop and take a moment to say thank you. During my visit with Dr. Albrecht, he and his staff were so courteous, polite and professional. I am truly blessed to be guided towards Dr. Albrecht and his team, they’re awesome. Dr. Albrecht is a very good doctor. This place is very nice and very friendly staff. The wait time is fast, in and out. I would visit again in the future.